Hearty salads for dinner are a house favorite. I don’t usually follow a recipe, using the bits and pieces leftover in the refrigerator, but for this week’s recipe for Cook the Book Fridays, a French bistro classic, I followed the rules. 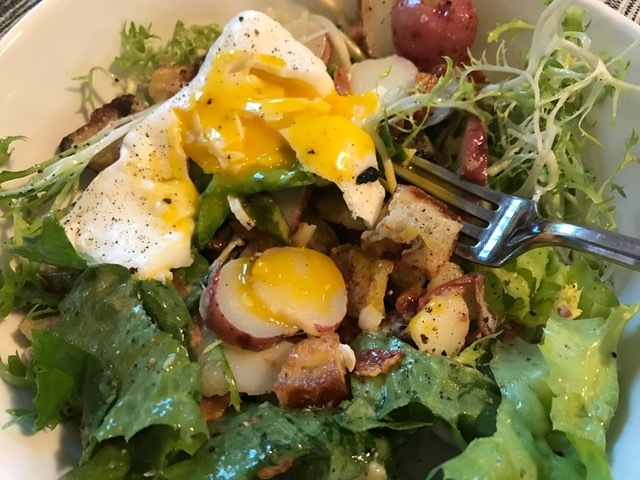 Salade Lyonnaise is bacon-and-eggs in salad form with a heavy dose of garlic thrown in. There are many components, but many of them can be prepared ahead, making it easy to pull together for a weeknight meal. The base of the salad is frisée, AKA curly endive. At first I couldn’t find any, just green heads labelled “chicory” which resembled a coarser form of frisée. Doing a Google search in the market, I learned that the chicory I found along with frisée and escarole are all in the same botanical genus, but curly endive and escarole are more closely related, being the same species, Cichorium endivia, with different leafing habits: one with lacy leaves and the other broad leaves. I decided to go with the escarole, but then came across curly endive in another section of the store. In the end, I bought both and made the salad with a mix of the two. My favorite part of the salad was the garlicky croutons. A crushed clove of garlic is cooked in a generous amount of olive oil to flavor it. Then the bread cubes are sautéed in the resulting garlic oil until they are golden brown and fragrant. 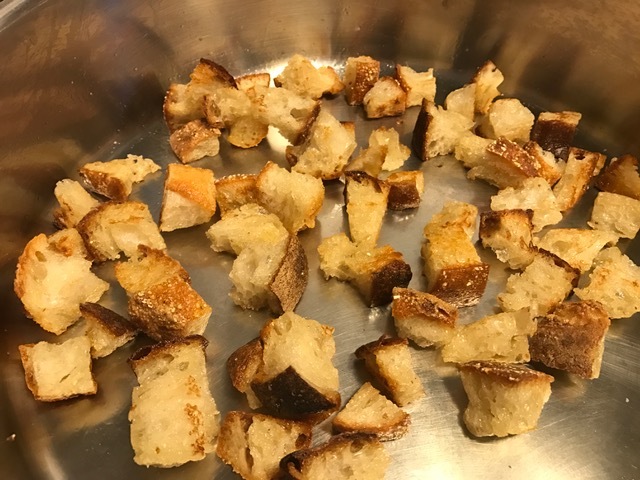 I often make croutons to have on hand for Caesar salads, but compared to these croutons, I’d have to dub my usual technique as spartan croutons because they are simply cubes of bread toasted in the oven with no oil or seasoning. 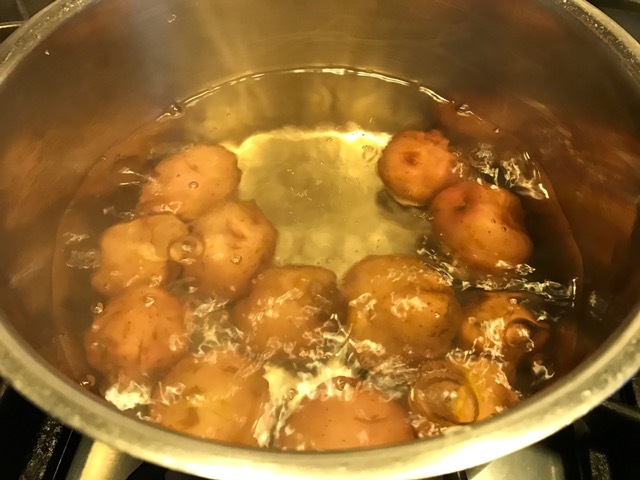 Boiled baby potatoes, bacon, and dressing round out the ingredients that can be prepared ahead. 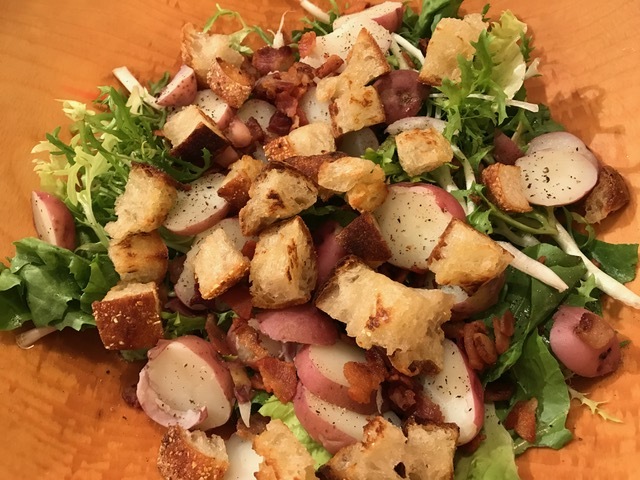 When it’s time for dinner, the salad can be assembled: endive, sliced potatoes, bacon, croutons, and that garlicky dressing. In the meantime, it’s time to poach the eggs. At my house, that’s Howard’s job because he’s an expert, making dinner is a team effort. I toss the salad and fill individual salad bowls so that they’re ready to be topped with the eggs after they are cooked and dried off. We had it two nights in a row, adding some leftover grilled asparagus for the encore appearance. The final verdict was two thumbs up. We both really enjoyed this one. You should try it too. You can find the recipe on page 99 of David Lebovitz’s My Paris Kitchen. My friends from Cook the Book Fridays review the recipe here. Posted on 5 May 2017, in General. Bookmark the permalink. 5 Comments. I must say asparagus fit in nicely here. Other than the salad greens and apple vinegar I used, I followed the recipe closely. The dish was satisfying as a meal itself, for me! How come I didn’t think of mixing two kinds of green? That makes a lot of sense. Howard deserves some credits for the egg. You and Howard like this salad as much as I do now. I also think that I will not play around with this classic – serving it as directed just brings back a good memory. I will try the poached egg the next time I make it. I use Hugh Fearnley-Whittingstall’s method and they are always perfect. Not so much with my hard-boiled eggs for the salad. I like the French version (a bit raw) and felt my eggs were a bit over-cooked for this salad. I agree that the croutons are delicious and pretty easy. I made this salad all at once but did decide that I will do the prepping and get the croutons and potatoes done so it can be easily assembled for lunch or dinner. Thanks for the frisée tutorial. I went with escarole because it was the only thing I could find. First time Whole Foods had let me down! I thought of you the entire time I was at the Little White House in Warm Springs. Thanks for taking that memorable trip with me, Betsy. Two nights in a row? So good! I could eat this EVERY night. Glad I found frisée this week but good to read about the substitutes (though I do think any lettuce might work here!). Once of my fave dishes so far! The garlicky croutons were my favorite part of this salad too! Another winner!